More and more men have now discovered the wonders that day spa treatments have to offer and many of them make an appointment as part of their regular grooming regimen. 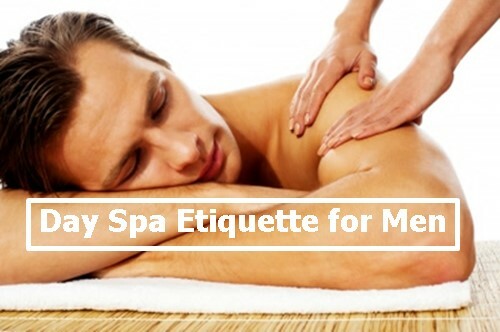 To ensure that every trip to the spa will be much more rewarding and pleasant, here are some valuable tips on the right etiquette for our male spa goers. If you think you won’t make it to your appointment with your spa specialist, then inform your spa ahead of time to avoid any inconveniences. Your credit card will likely still be charged depending on the your spa’s cancellation policy and fees associated with it. Ideally, you may want to arrive at least 15-30 minutes prior to your scheduled appointment. This allows you to relax and enjoy the other facilities like the sauna, swimming pool that spas provide to their customers. Many spa nowadays also offer access to their gym where men can work out those muscle before they have their treatments. When you arrive early, it gives you enough time to shower before having any treatments done. Steam showers and saunas are recommended to open up the pores and prep up the entire face and body for the treatment. It’s best to for men to have a clean-shaven face before doing any facial treatments as this ensures that products applied to the face will be done well without facial hairs interfering. Your aesthetician can treat those problems in your face susceptible to razor burns and skin irritation. This tip applies to anyone who visits a spa salon; not just men. The phone’s ringing or vibration may distract you and your therapist so keep your mobile phone on silent mode or better yet, completely turn it off. In most spas, wearing underwear is purely optional so it’s up to the male guests if they want to have their underwear on or not. If you’re not comfortable naked in front of a stranger, then you can opt to wear boxer shorts or disposable underwear. If you really want to keep your clothes on, you can try having Thai Massage or Reflexology. You may also be required to wear swimsuits before using other facilities like bathtubs and steam saunas. It is very important that your spa specialist is aware of any health concerns or injuries that you may have. Provide details about your injuries, allergies or your overall condition during the consultation to ensure that there are no nasty surprises and this will be taken cared of during the treatment. Some clients prefer to strike a conversation with their spa attendants while others just want to remain quiet all throughout the session. Your spa attendant should be able to follow your lead. However, if you wish to just zone out and relax but your spa attendant doesn’t stop talking, politely say that you want to stay quiet and relax. Your spa attendant should be able to get it. There is much debate about how much a client should tip their spa attendants or if at all. If the spa adopts a no-tipping policy, then don’t give any tips but rest assured, the amount you paid for their services pretty much covers everything as if tips were already included. But if spas are tolerant about tipping, a 15-20% tip is usually recommended. If your attendant did an amazing job, then tip him or her appropriately to show your appreciation.